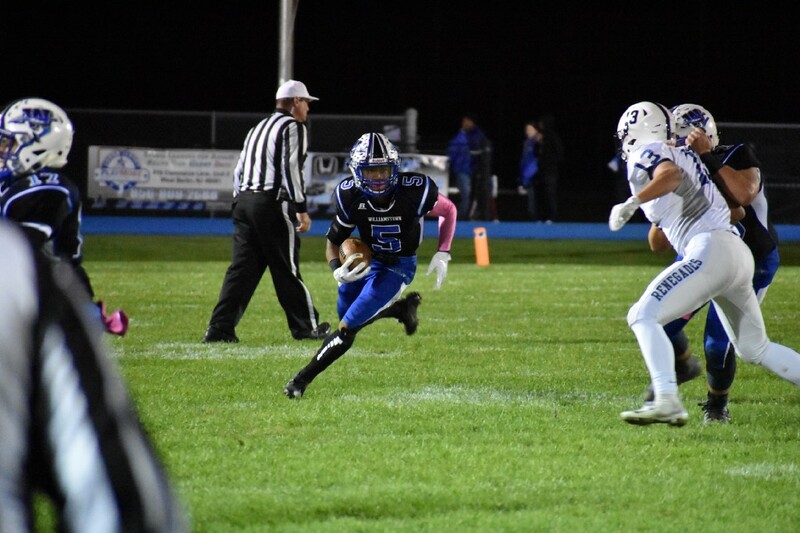 Inge had three rushing touchdowns and over 200 total yards in Williamstown’s 48–14 victory over Shawnee on Friday night. He did so while thinking of his family. Wade Inge said it himself after the game; this was probably the best game of his high school career. Standing at the center of the field postgame after a 48–14 win over the Shawnee Renegades (2–5), where Inge’s Williamstown Braves (8–0) completed yet another convincing victory to keep it’s undefeated season going, Inge said he hadn’t had that productive of a game, statistically, in years. By the end of the first half, Inge had over 200 yards and three rushing touchdowns on just 13 carries, helping put his team up 27–7 at halftime, despite a slow start after the first two drives of the game yielded no points. “I feel like when we came back to the sideline a couple times after not getting the job done on the first two drives, we said to each other ‘we’ve got to step it up, we’re not playing Williamstown football, this is not what we do. We got to put some points on the board,’” said Inge. Inge has been a four-year starter for the team and, according to his coach Frank Fucetola, has always been one of the hardest workers at practice and throughout the season. Football runs in the family for Inge. His brother, Turner Inge, is a freshman on the team at Williamstown. He’s had multiple cousins come through the program that now play in college, including his cousin Bill Inge, who currently plays at East Stroudsburg University and leads the team in tackles on the season. Football was just what he and his family did together. It just so happens that it’s also a way for him to honor family as well. During the game, Inge was wearing pink tape under his eyes with the words “Grandma Sharon” written in black. Although he never got to meet her, since she passed away after battling with breast cancer before he was born, Inge’s dad tells him stories all the time about when he was younger growing up. “It’s a special time period cause, even though I never got to meet her… I know she’s looking above and she’s watching and I get to perform for her,” said Inge. And perform Inge did. Although he did not carry the ball much in the second half after the monster first two quarters he put forth, Inge finished the night with over 200 yards and three touchdowns in the team’s victory over Shawnee. Inge noted that his performance was very much in fact due to the blocking of his offensive line, something that his coach stated after the game as well. The three touchdowns by Inge was a season high thus far, bringing him to 11 total touchdowns on the season. “He’s just a tremendous leader, you saw it tonight. This is week in and week out that he’s stepping up now,” said Fucetola.